Our projects are born from the continuous necessity of drawing from the fountain of knowledge in order to incorporate what we have learned in the foundries of the universities where, year after year, it is fused and becomes solid- The projects represents our hidden dreams, that desire to experiment and to discover where turns dreams into reality. From years we have worked with the aim of letting the terroir express itself just as it exists in nature. In the fermentation and aging of the wines, we minimize technological intervention, but we are often compelled to use yeasts prepared by the bio-technological industry which, though of excellent quality, are utilizable everywhere, by everyone, and for each and every grape variety. It should be clear, however, that in wine the aromas are not simply created by yeasts, but rather varietal aromas, those of the grapes themselves, and aromas which develop from the interaction of yeasts, working through enzymes, and molecules present in the grapes. We are, accordingly, continually searching for yeasts linked to the individual grape variety and therefore to a precisely determined area. Our part of departure is the concept that, in a given territory, there are various yeasts, not all of excellent quality, and that our research work consists in selected the finest strains and reproducing them year after year. Working in this way, we can achieve wines whose sensations reflect their territory of origin and whose aromas and flavors have not been “interpreted” (i.e. transformed) by yeasts originating from the other side of the world. In order to realize this difficult objective, we have begun to work with one of the maximum authorities in the field, Professor Giancarlo Moschetti, with whom we have undertaken the ambitious mission of selecting yeast strains from the vineyards of every producer with whom we collaborate. Giancarlo Moschetti is Full Professor of Oenological Microbiology in the DEMETRA Department of the University of Palermo in Sicily. After graduating in Agricultural Sciences at Portici University near Naples in 1991, he won various scholarships in Italy and abroad, working principally on research into the genetic basis of significant micro-organisms present in crops and food products. He is currently the president of the course on viticulture and oenology at Marsala (Sicily). He has been involved for years in research on microbial diversity as an index of evaluation of quality, on the aforementioned research into the genetic basis of significant micro-organisms in crops and food products, and on the improvement of wines based on the microbiological characteristics of the musts in fermentation. In order to reach the desired objectives, he has availed himself of collaborative work of numerous colleagues, both in Italy and abroad. His research work is testified to by more than 100 publications in Italian and international journals, 58 of which are international. Since the year 2009 he has been responsible for the research project of the Campania region, the STAPA -CEPICA, the regional agricultural department (sector of Avellino), dealing with “demonstrative evidence on the utilization of territorial-specific yeasts in order to improve the wines of the province of Avellino”. He is a reader for numerous international journals of microbiology and a member of the direction of the Italian Society of Agricultural Microbiology (SIMTREA). He is the scientific advisor to the “Contrada di Taurasi” estate, with which he has collaborated for seven years. Moschetti, G., Aponte, M., Blaiotta, G., Casaburi, A., Chiurazzi M., Ventorino V. and Villani F. (2006) Characterization of halophilic Archea isolated from different hypersaline ecosystems. Annals of Microbiology, 56, 119-127. Mariniello L., Giosafatto C.V.L, Moschetti G., Aponte L., Masi P., Sorrentino A. and R. Porta(2007) Fennel waste-based films suitable for protecting cultivations: BioMacromulecules 8: 3008-3014. Ventorino V., Chiurazzi M., Aponte M., Pepe O. and Moschetti G. (2007) Genetic diversity of a natural population of Rhizoboim leguminosarum bv. Viciae nodulating plants of Vicia faba in the vesuvian area. Current Microbiology, 55: 512-517. Camerini S, Senatore B, Lonardo E, Imperlini E, Bianco C, Moschetti G, Rotino GL, Campion B, Defez R (2008). Introduction of a novel pathway for IAA biosynthesis to rhizobia alters vetch root nodule development. Archives of Microbiology, 190(1): 67-77. Bonanomi G., Chiurazzi M., Caporaso S., Del Sorbo G., Moschetti G., Scala F. (2008) Soil solarization with biodegradabile materials and its impact on soil microbial communities. Soil Biology & Biochemistry 40: 1989-1998. Alfonzo, A., Conigliaro, G., Torta, L., Burruano, S. and G. Moschetti (2009) Antagonism of Bacillus subtilis strain AG1 against vine wood fungal pathogens. Phytopathologica mediterranea 48 (1): 155-158. Alfonzo A., Conigliaro G., Torta L., Burruano S., Moschetti G. (2009) Antagonism of the endophytic Bacillus subtilis strain AG1 to fungal pathogens that cause tracheomycotic deterioration of wine wood. Proceeding of 6th International Workshop on Grapevine Trunk Diseases “Esca and Grapevine Declines”. Florence, Italy 1-3 September 2008, Phytopathologia mediterranea 48 (1):186-187. Francesca N, Chiurazzi M, Romano R, Aponte M, Settanni L, Moschetti G. (2010). Indigenous yeast communities in the environment of ‘‘Rovello bianco’’ grape variety and their use in commercial white wine fermentation. World Journal of Microbiology & Biotechnology, ISSN: 1573-0972, doi: 10.1007/s11274-009-0181-5. Aponte M, Ventorino V, Blaiotta G, Volpe G, Farina V, Avellone G, Lanza CM, MoschettiG (2010). Study of Sicilian green table olive fermentations through microbiological, chemical and sensorial analyses. Food Microbiology, 27: 162-170. Lo Piccolo S., Ferraro V., Alfonzo A., Settanni L., Ercolini D., Burruano S. and Moschetti G. (2010) Presence of endophytic bacteria in Vitis vinifera leaves as detected by fluorescence in situ hybridization. Annals of microbiology, 60: 161-167. DOI: 10.1007/s13213-010-0023-6. Mazzei P., Francesca N., Moschetti G. and Piccolo S. (2010) NMR spectroscopy evaluation of direct relationship between soils and molecular composition of red wines from Aglianico grapes. Analytica Chimica Acta, 673 (2): 167-172. doi:10.1016/j.aca.2010.06.003. Settanni L., Moschetti G. (2010). Non starter lactic acid bacteria used to improve cheese quality and provide health benefits.Food Microbiology, 27 (6) 691-697. DOI 10.1016/j.fm.2010.05.023. 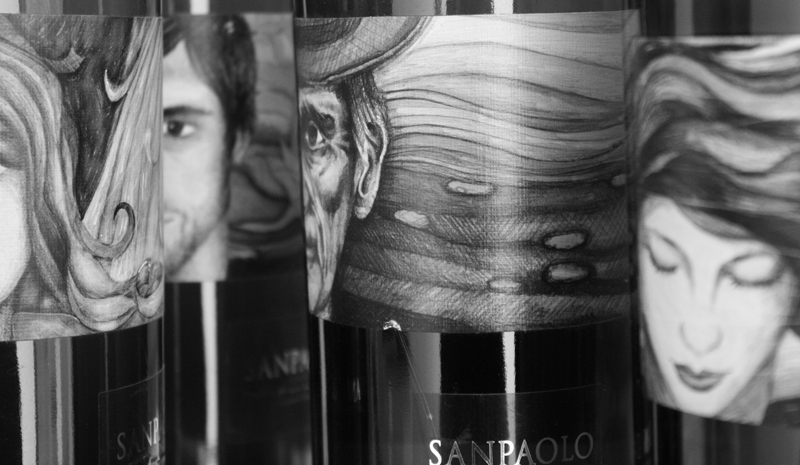 We of the Sanpaolo estate, part of the Magistravini group, wished to support the theses of our consulting oenologist, encouraging him to carry forward a program which we are truly proud of; the project which we – during the entire process of its gestation – called FF (Four Falanghina) and which has given us four different Falanghina wines of very high quality, each so different from one another that it would be difficult to trace a common origin. The four Falanghina-based wines have been called EARTH, AIR, FIRE, WATER after the characteristics of the terrain in which the vines sink their roots, exchanging in the bowels of the earth those elements which created these striking differences. Fresh wines, genuine, and faithful to their territory, their grape variety, and their producer have been born from our collaborative work. Though faithfully respecting the dreams we share with the producers, their realization, unfortunately, is not always possible. The climatic conditions, the cellar technology which is available, and the maturity of the estate are variables which are difficult to control, reasons for which, one can happen to work with a winery which manages to reach these objectives solely in certain vintages and in cathartic moments in which concentration, passion, and the stars are particularly favorable. In these special, and rare occasions, dream wines are born, perfect wines which are fully able to represent the emotions generated by the primordial dreams of the producer.